Dear aspired job seekers here are good news for you all. 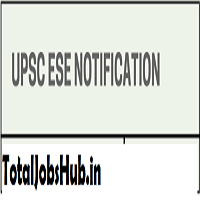 UPSC ESE Notification 2018 -2019 is Available Online on 26th September 2018. Candidates now registered their name via online registration process and start preparing for your exams. Union Public Service Commission is now open the form submission window till 22nd October 2018 for the upcoming ESE (Pre and mains). Find more relevant information below. As per the latest UPSC updates, the commission has prepared the plan for UPSC ESE Preliminary Exam 2018 for 6th January 2019 to shortlist the selected ones for the UPSC ESE Main Exam 201.8 The Union Commission will conduct the Main exam on July on the basis of which applicants will further be shortlisted for Personality/Face to face Interview. Recruitment on the results of this examination will be made to the Services/ vacancy:‐ Civil, Mechanical Engineering, Electrical, Electronics & Telecommunication. The merit list is to be generated category-wise which will be comprised of the aggregated marks secured by a candidate in all the three stages. Another quick reminder to all our participants is that the UPSC ESE Online Registration 2018 begin on 26th September 2018. UPSC ESE Application Form will be accepted until 22nd October. More information is given in the following sections of this page. Don’t forget to read all the information. According to the gathered data, UPSC Engineering Services Examination 2018 shall be for the following posts. A candidate must be a citizen of India or a subject of Nepal/Bhutan/Tibetan refugee. In a case of being from a minor category, applicants are required to present their respective category certificate as a valid proof. Apart from all that, proper academic and professional certifications are must-haves before applying. Applicant’s age must be between 21-30 years or born between 2nd January 1986 and 1st January 1995. To appear in the UPSC ESE Notification 2018, it is must having an engineering Degree from a recognized University/Institution. Aspirants are to pay Rs. 200/- as the examination and registration fee. Payment Mode: Visa/Master Credit/Debit Card (State Bank of India/Hyderabad/Mysore/Patiala/Travancore) or Via cash in any nearest branch. No fee for candidates belonging to SC/ST/PH and female candidates. Visit the commission website first off. Look for the latest ESE Notification and read it carefully. After full consideration, start applying by filling the application form which is given in two parts part-I and II. Complete the payment and fulfill all the formal procedures.